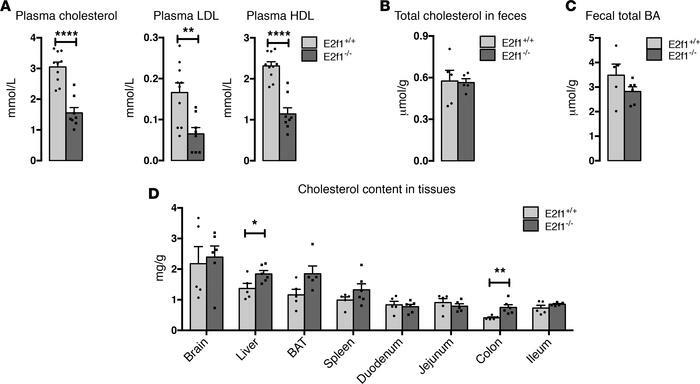 Decreased total plasma cholesterol levels and increased cholesterol content in the liver and colon tissues of E2f1–/– mice. (A) Plasma lipid profiles of E2f1+/+ and E2f1–/– mice fed a normal chow diet. n = 8–10 mice per group. (B) Quantification of total free cholesterol levels in feces collected from individual mice using commercial kits. n = 5 mice per group. (C) Quantification of total bile acid (BA) levels in feces collected from individual mice using commercial kits. n = 5–6 mice per group. (D) Quantification of the cholesterol content of various tissues from E2f1+/+ and E2f1–/– mice fed a chow diet. BAT, Brown adipose tissue. n = 5–6 mice per group. All data are presented as the mean ± SEM. Differences between E2f1+/+ and E2f1–/– were determined by 2-tailed unpaired t test. *P < 0.05, **P < 0.01, ****P < 0.0001.